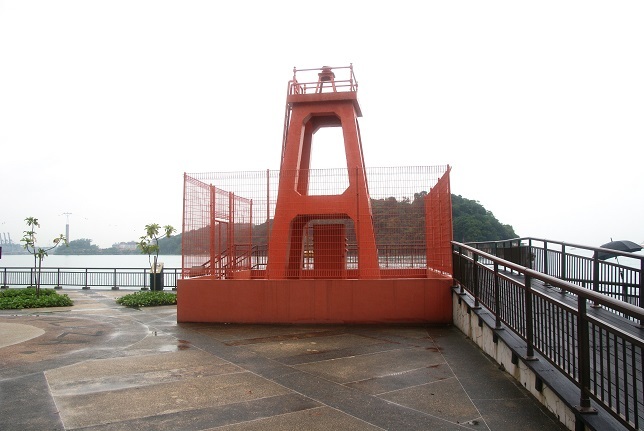 Located on an outcrop at the southernmost end of Labrador Park, the iconic seven-metre tall structure at Tanjong Berlayer served as a navigational beacon for boats and ships approaching Keppel Harbour in the mid-20th century. Ships entering the harbor used the red Berlayer Beacon as a visual marker to navigate themselves towards the harbor. There is a corresponding conical green beacon on Tanjong Rimau in Sentosa. Together, the Berlayer Beacon and the Tanjong Rimau Beacon served as the port (left-hand) and starboard (right-hand) navigational markers for boats entering the Singapore harbor. Today, Tanjong Berlayer is known not just for the beacon, but also for its 4 original gun platforms of the Labrador Battery built by the British in the late 19th century to defend Singapore’s waters.